The royal harlequin from Playson is back, this time with an impressive 40 paylines. 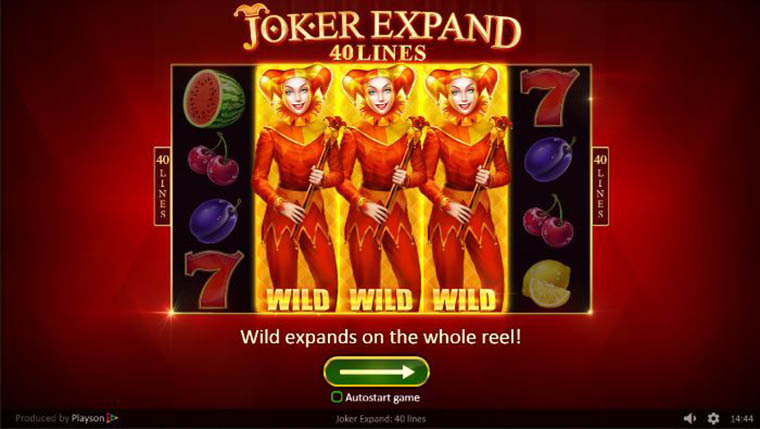 Joker Expand is the extended version of the already famous online video slot Joker and it comes with 2 scatters, a diamond and a golden one, as well as with an expanding wild. Spinning the 5 reels and 3 rows is accessible from any device – the fruit themed symbols look juicy both on mobile devices as well as on desktop platforms. The starting bet is €0.20 and it will go up to €100, for all of the high rollers out there. There are two types of scatters, the Gold Star and the Diamond Star. Landing three of the latter means you will be getting a prize of up to 20x your stake. Landing 3, 4 or 5 instances of the Gold Star will, in turn, multiply your stake 2, 30 or 100 times. With an RTP of 96.49% and medium variety, you can surely expect some excitement. Why play it: Joker Expand 40 lines is straightforward, well designed and all about the gameplay/. Sure, there are no in-game bonus features, but that only means that the fun comes all from spinning the reels, just like in the old days of classic fruit machines.